The Nike KD 10 Aunt Pearl will be the 7th signature shoe from Kevin Durant to pay tribute to his late Aunt Pearl who passed away from lung cancer in 2000. To keep her memories and spirit alive, Nike Basketball and KD continue to release special edition Nike KD series inspired by Aunt Pearl. Proceeds from the shoe will go to the Kay Yow Cancer Fund that was founded in 2007 and an organization in which Nike is a founding partner. Dressed in a Pearl Pink, White and Sail color scheme. 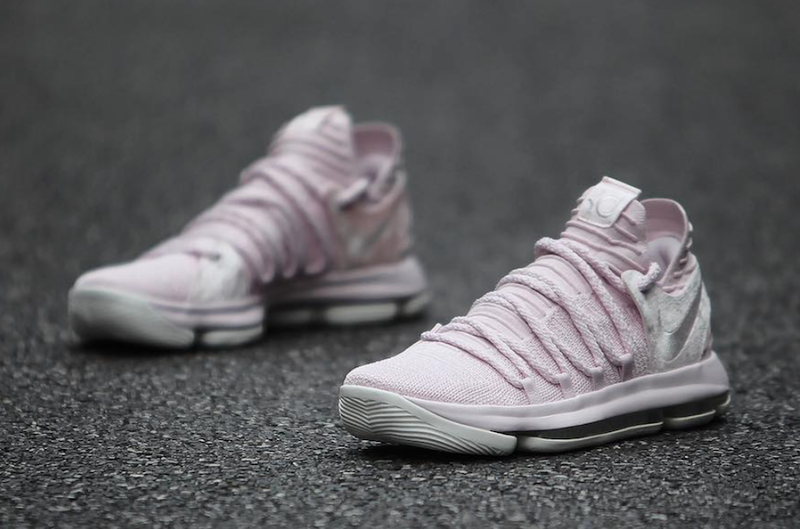 This Nike KD 10 comes with Pink tones throughout, feathered heel atop a Sail rubber outsole. Look for the Nike KD 10 “Aunt Pearl” to release on February 28th at select Nike Basketball retailers and Nike.com. The retail price tag is set at $150 USD. UPDATE: Kevin Durant’s “Aunt Pearl” Nike KD 10 will be available in full-family sizing. UPDATE: Nike releases official photos of the “Aunt Pearl” KD 10 retail pair releasing February 28th. UPDATE: Here’s a closer look at the “Aunt Pearl” Nike KD 10 via Duke Women’s Basketball.